Abstract: Calibration curves were built for a standard set of polycyclic aromatic hydrocarbons (PAH) and applied to engine oil samples containing various levels of PAHs and alkylated PAHs. Following expectations for combustion efficiencies, larger levels of each PAH correlated with engines driven shorter distances routinely. 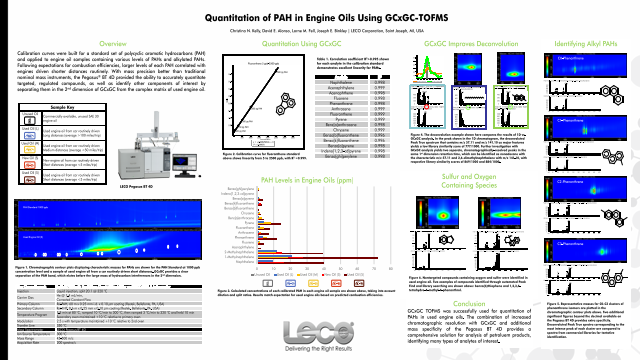 With mass precision better than traditional nominal mass instruments, the Pegasus® BT 4D provided the ability to accurately quantitate targeted, regulated compounds, as well as identify other components of interest by separating them in the 2nd dimension of GCxGC from the complex matrix of used engine oil.Summary: GCxGC TOFMS was successfully used for quantitation of PAHs in used engine oils. The combination of increased chromatographic resolution with GCxGC and additional mass specificity of the Pegasus BT 4D provides a comprehensive solution for analysis of petroleum products, identifying many types of analytes of interest.